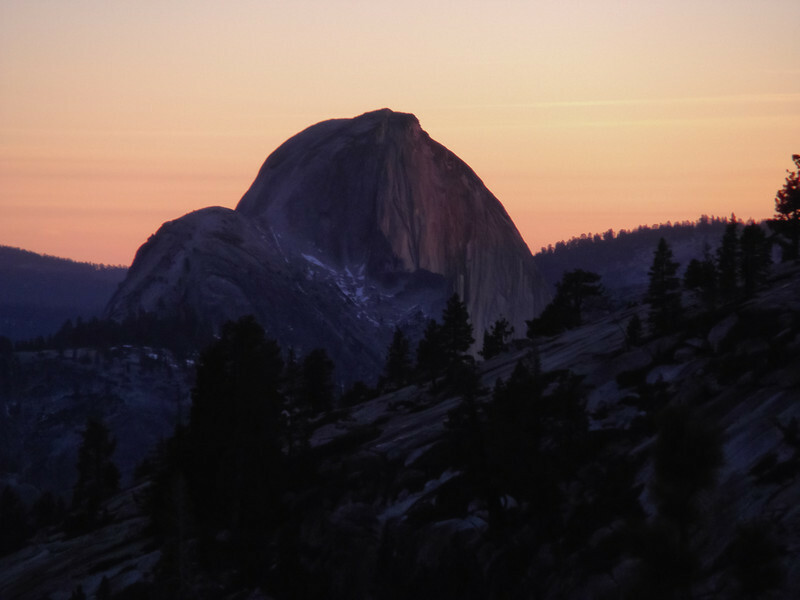 Having crashed in Hotel Subaru near Tioga Pass, we intended to wake up at 5:45 A.M. on Saturday for an alpine start – but the dreaded AM/PM setting on the alarm clock struck again! We were delayed a bit and didn’t get going until 8 A.M. from the car. The gate to Saddlebag Lake is currently closed, although the road up to Saddlebag lack is completely dry. While it is paved walking, it unfortunately adds 5 miles round trip to the approach. 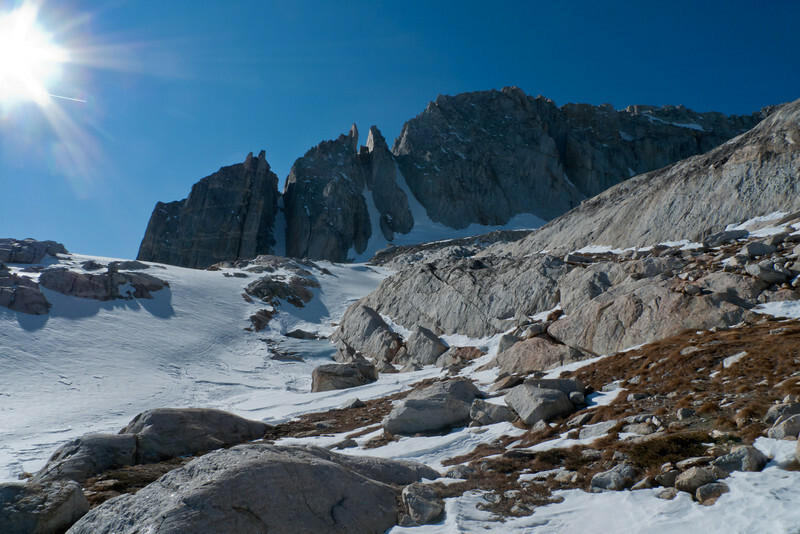 After reaching the edge of Saddlebag Lake, you shift to a rock trail approach which did have patches of snow ever so often. 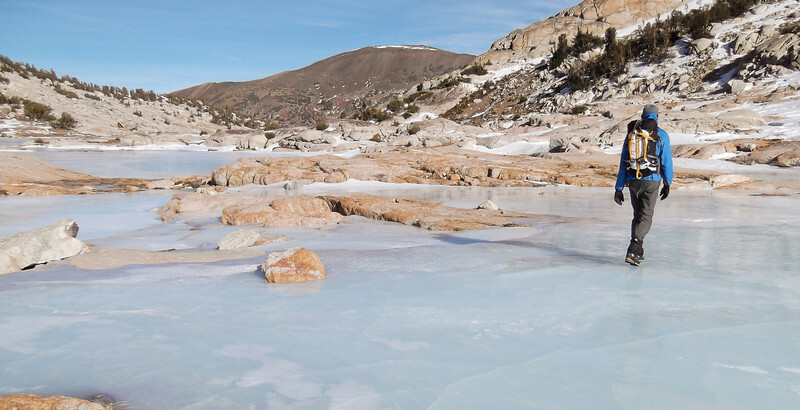 It was really cool to see all of the lakes frozen, however – as this area is usually inaccessible this time of year unless you are willing to skin a massive distance from 395. 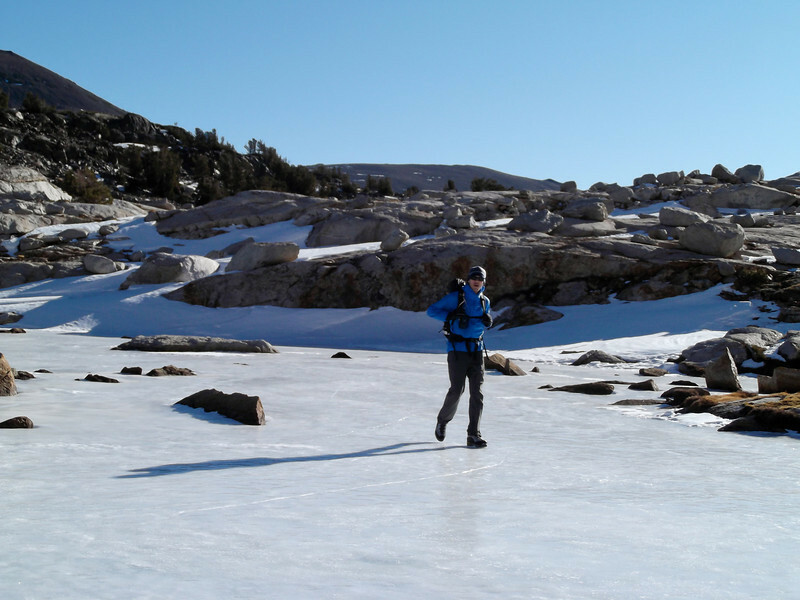 Here, Brandon works along the trail with a frozen Saddlebag Lake to the right. 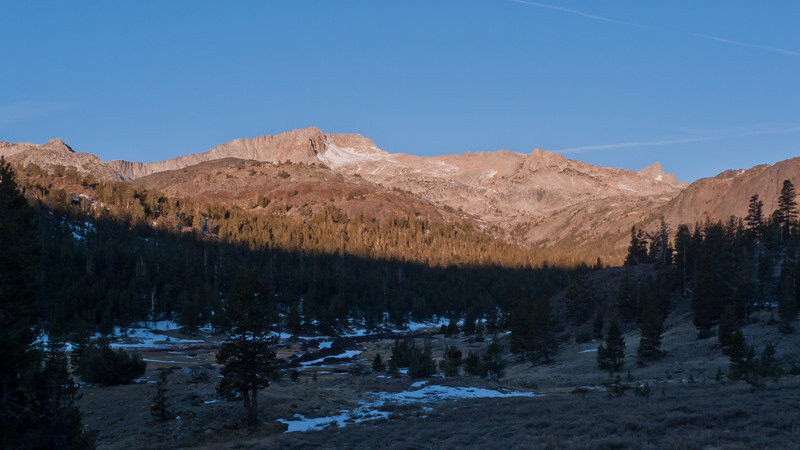 For context, North Peak itself lies right on the NE edge of Yosemite National Park, with the SW side of the Peak in Park boundaries, and the NE side of the peak in the Inyo National Forest. A shot of North Peak with a frozen Greenstone Lake in the foreground. 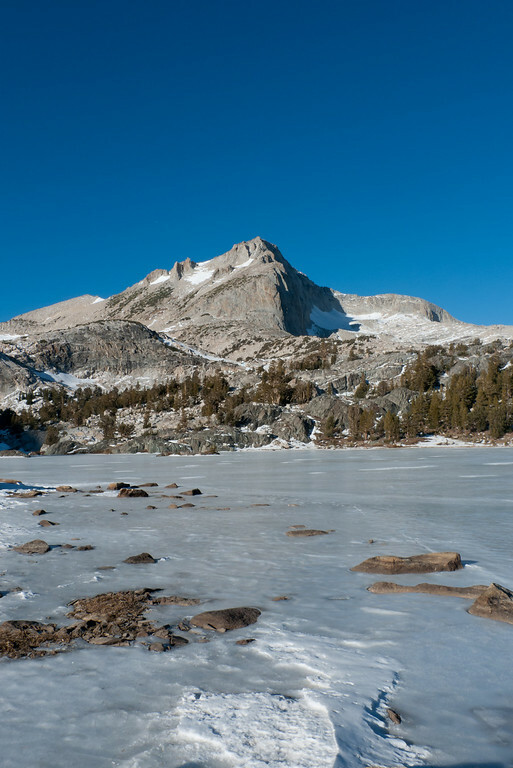 Notwithstanding there is no snow, it has been (and was) very cold up in the High Sierra as of late. The day time highs for Saturday at the general elevation of 11,000 ft. were 23, and the shady couloirs up to 12,000 ft. were in the teens. On the approach, the wind had not yet picked up, so it was pretty pleasant moving. 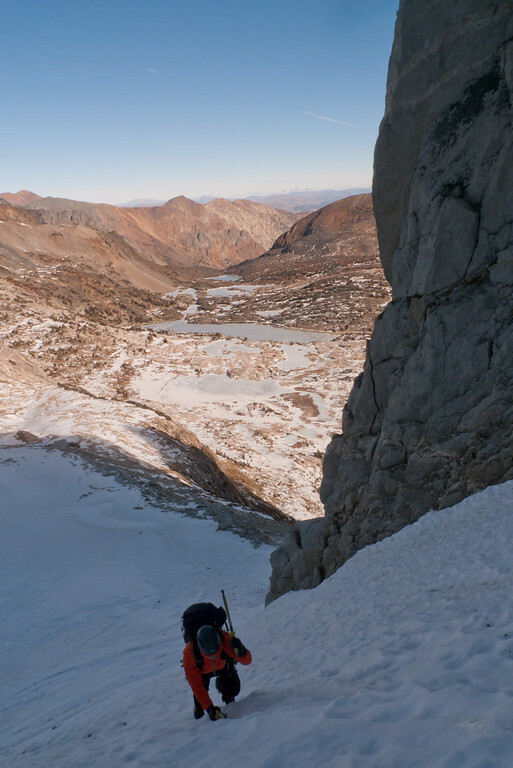 Upon reaching Cascade Lake, we started to get views of the North-facing couloirs on North Peak – and the wind was starting to pick up. 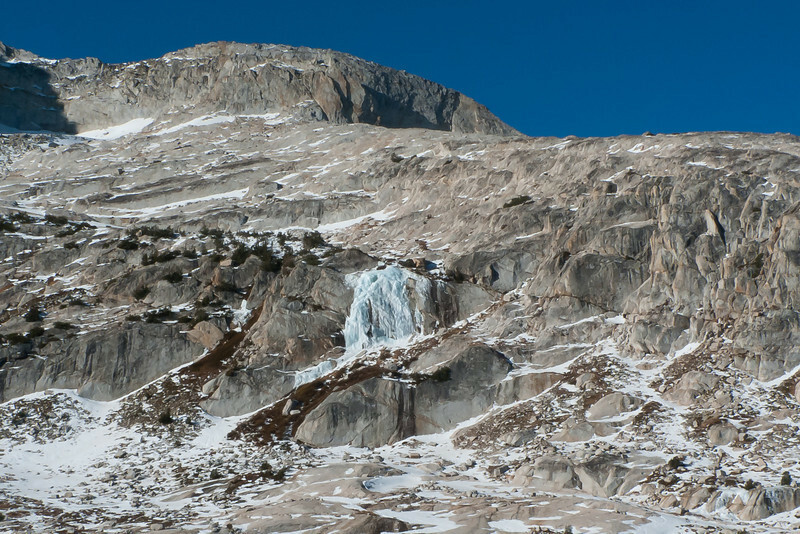 We also spotted a nice ice-flow on the edge of Cascade Lake, but didn’t really have time to try a top-rope as we wanted to make it a quick day to be back before the sun went down in the short winter day. 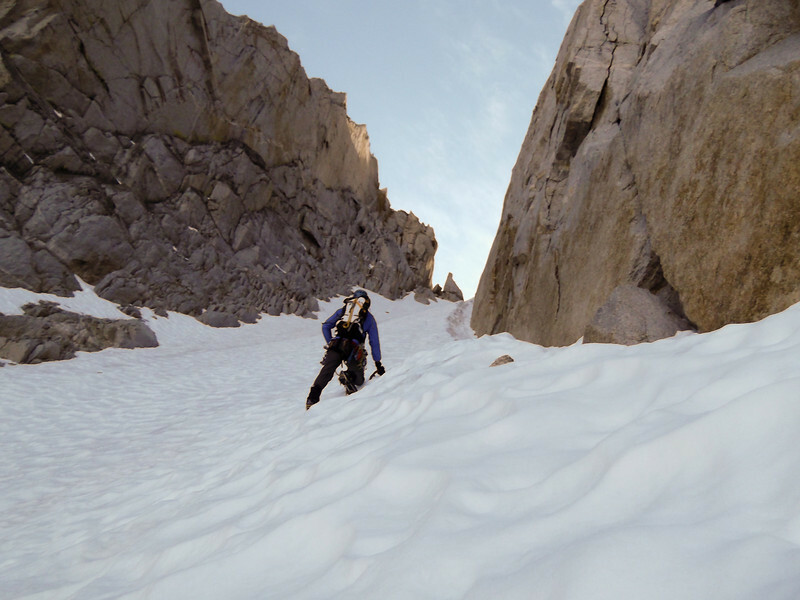 Technically, North Peak has three couloirs that are North Facing. From left to right, (i) the first is around 50-60 degrees I believe and has bolted anchors for rappelling as there is no direct access to the summit ridge from the top; (ii) the middle obviously narrows significantly and typically chokes out before the top; and (iii) the classic line to the summit is the far right couloir (around 45-50 degrees). 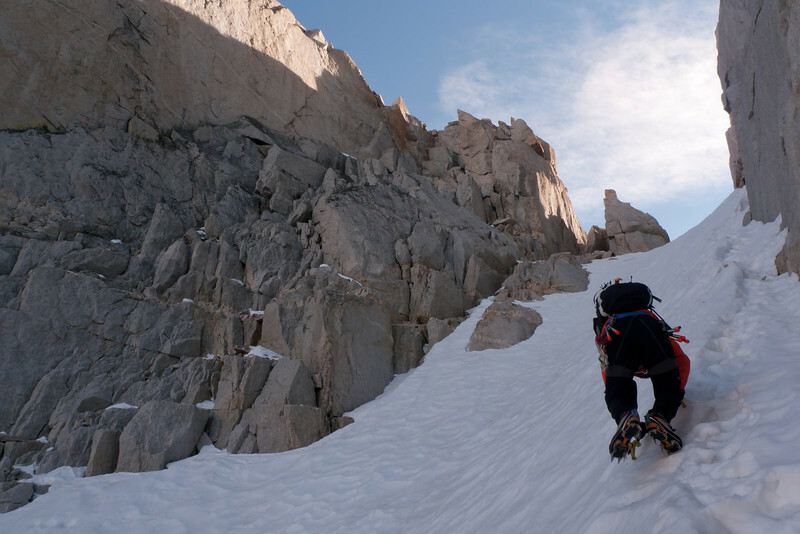 Our goal was the climb the far right couloir, and then upon reaching the top, scramble up the third class rock route to the summit 300 feet higher. 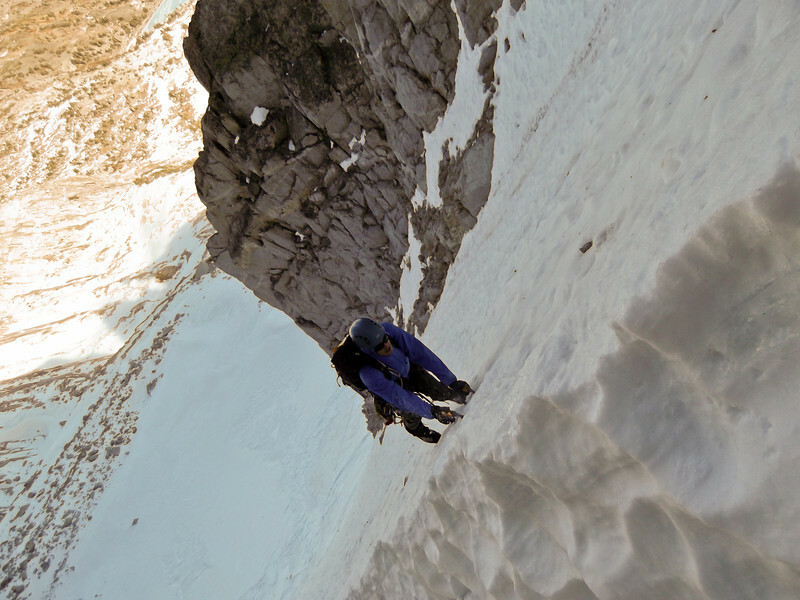 At the base of the couloirs, we could tell (as expected) there was not exposed alpine ice. Likely on account of the October snowstorm. However, it looked like hard neve, which would make for quick climbing. At this point, the winds were really starting to pick up. Coupled with the temps in the teens, the wind chill was very cold. 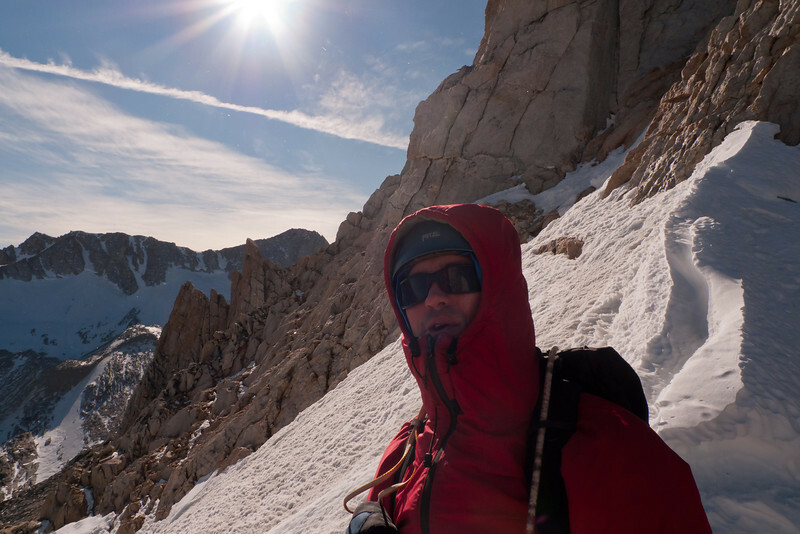 Brandon and I were never really cold as we were moving relatively quickly and had proper layering – but it definitely had a winter alpine climb feel. For me, it added to the enjoyment as the wind was causing spindrift to fly all around the couloir. A lot different than the more traditional August-September High Sierra alpine season! After some post-holing at the approach apron in faceted snow, we gained the harder neve and booted up to the right-hand side. Based on beta, it is better to climb towards the right of the couloir as any falling ice tends to make its way to the left side. Here, Brandon works up the apron once the snow hardened. At the base of the couloir proper, we decided we were both comfortable just soloing up because of the hard neve conditions. It is much easier and less straining than climbing ice (although you certainly would not want to fall in this). 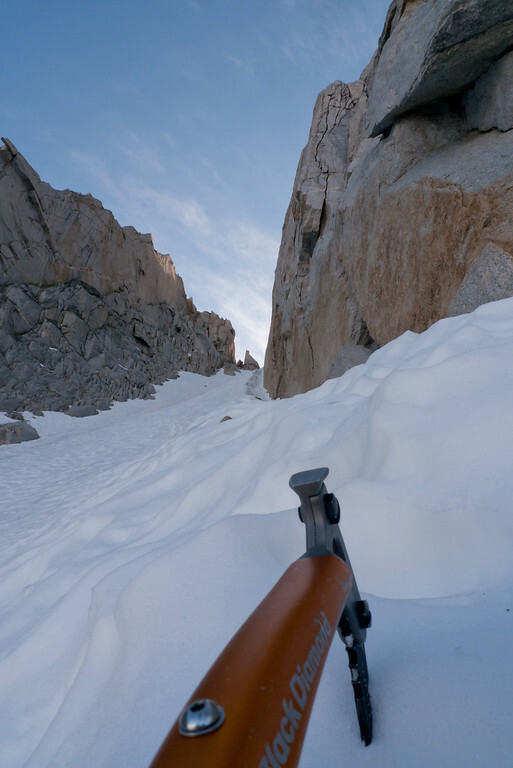 More importantly, the far right side next to the wall had a channel of softer snow that offered good spots to rest. So we would leap-frog up the right part of the hard neve, and step over into the softer snow channel to rest as the person below climbed up past to a higher position. 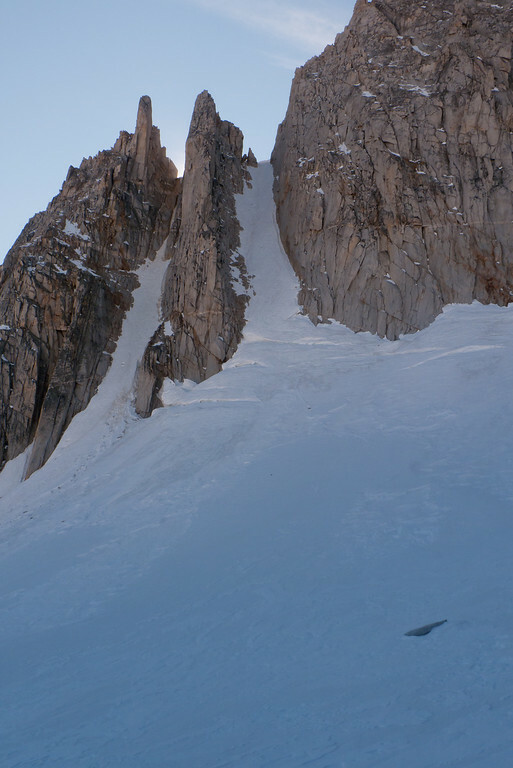 Looking up from the base of the couloir proper. You can make out the narrow softer snow channel right next to the wall. Brandon coming up the entrance to the couloir. 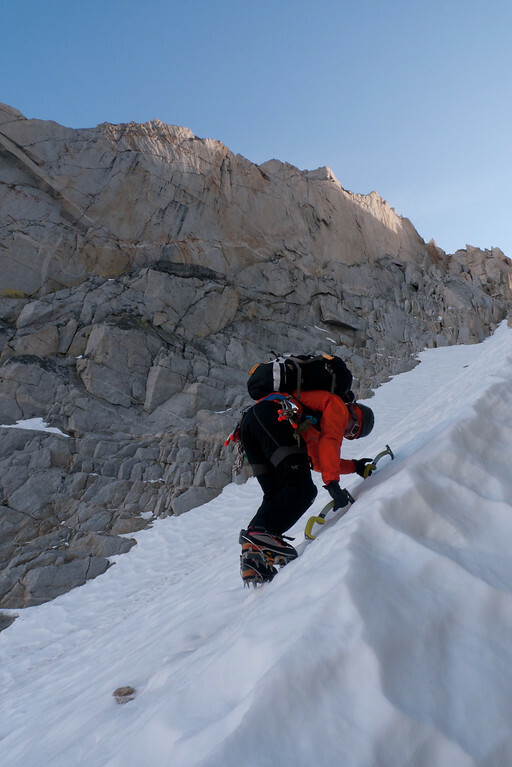 Nick working up a little farther in the couloir. 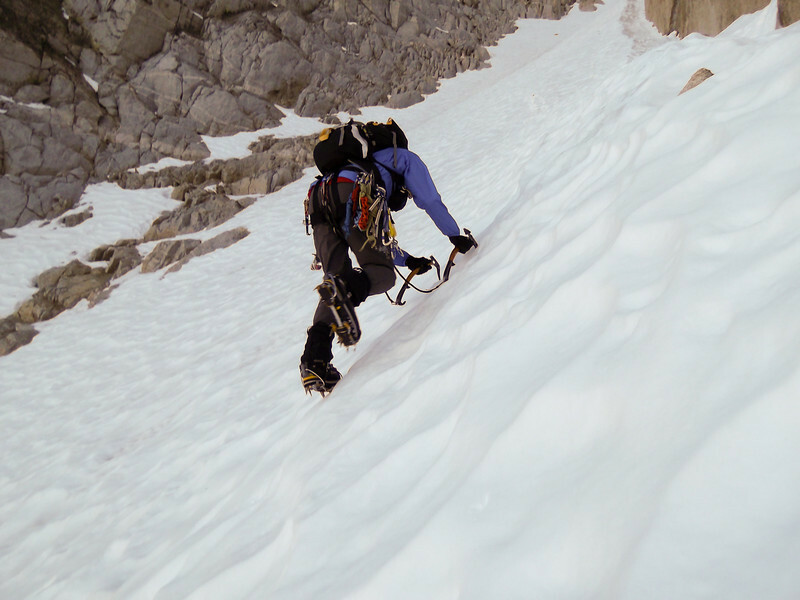 Note: Brandon’s camera angle was off – it is not as steep as it looks here. 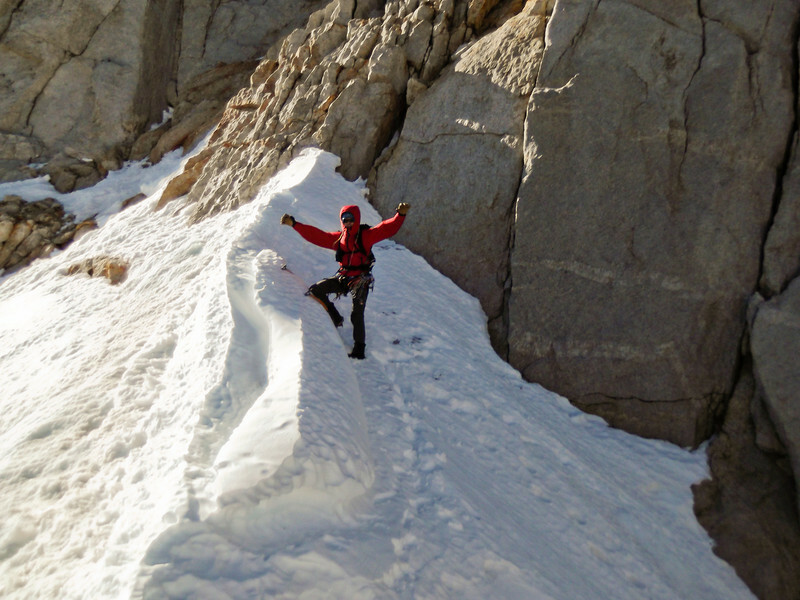 I would say the couloir is generally 45+ degrees and steepens up to 50+ degrees in a couple of spots near the top. 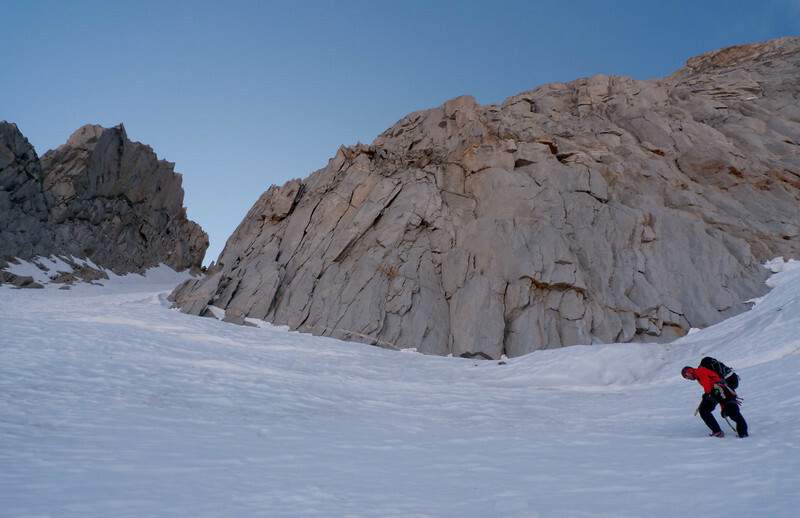 In soft snow conditions, this would be totally skiable – in hard neve conditions it makes for quick climbing – and in pure ice conditions I would definitely want screws and belay stations. 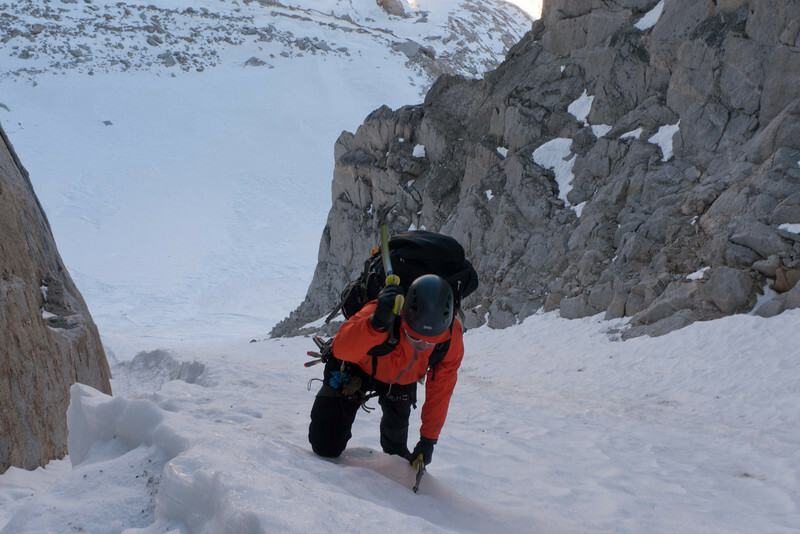 We had brought a 70M thin 8.9 rope, ice screws and a very light alpine rack (5 DMM offset nuts and a single BD #1 Cam) – but based on conditions we didn’t use any of it. 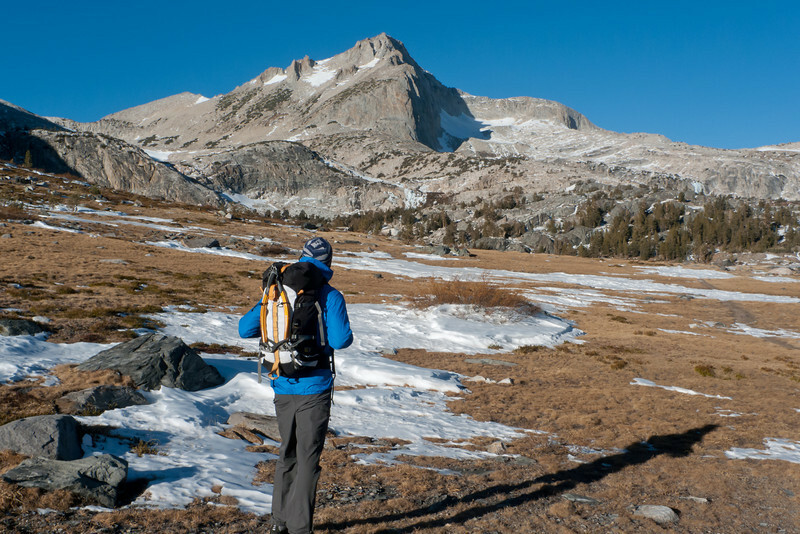 It’s funny – when you bring the gear, you don’t end up using it – but when you don’t bring the gear, you end up needing it. I would always rather just play it safe and take the weight penalty for the pro if I need it. 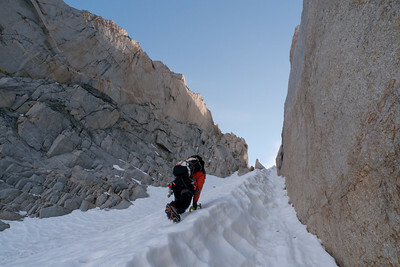 Brandon moving beyond towards the middle of the couloir. Our system of leap-froggin up the right side of the hard neve and taking rests in the snow channel was working very well. Here you can pretty much see Brandon out on the neve, and were it drops off into the melted out, looser snow (and by looser, I mean you could kick a full boot into). Starts to get steeper towards the top (until it lessens at the very top with a roll-over). Brandon at a steeper bulge, until the rollover at the top. Coming up the final rollover to the finish. 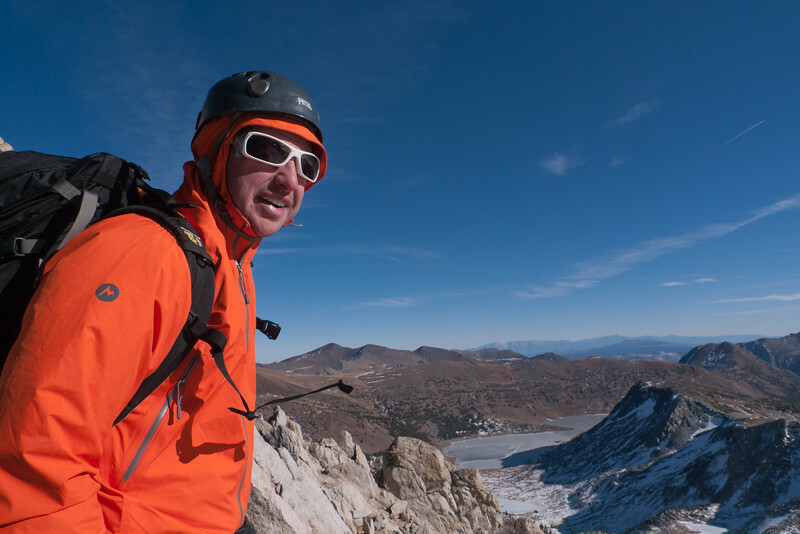 By the top of the couloir, the winds were absolutely screaming. 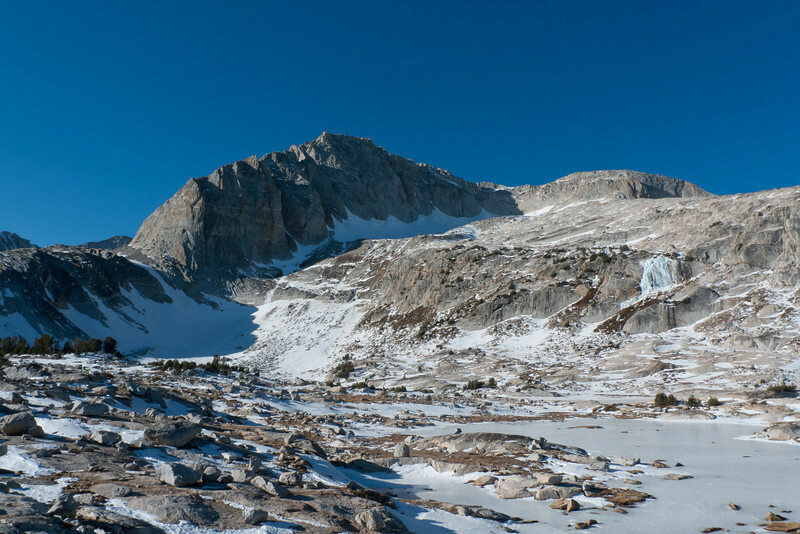 The forecast for around 11,500 ft. on NOAA had called for 30-50 mph winds. I would definitely say they were at the top of that range, as the couloir was acting like an absolute wind-tunnel. It was cold and you couldn’t really look back down as it would cause tons of spindrift to hit into your face. At our vantage point, it looked like a quick, easy 300 vertical feet to the summit up a third-class ramp. However, neither of us had any interest in going up due to the wind. 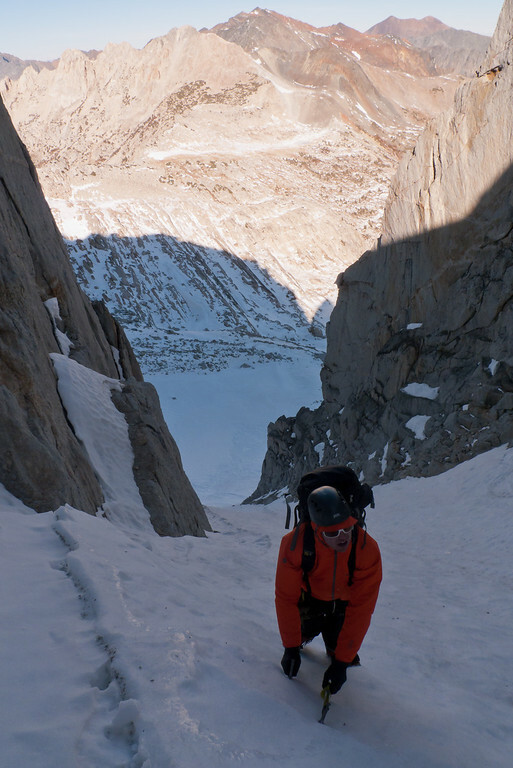 I will definitely be back in this area to climb the other couloirs in the more traditional season regardless. Looking East towards Saddlebag Lake. 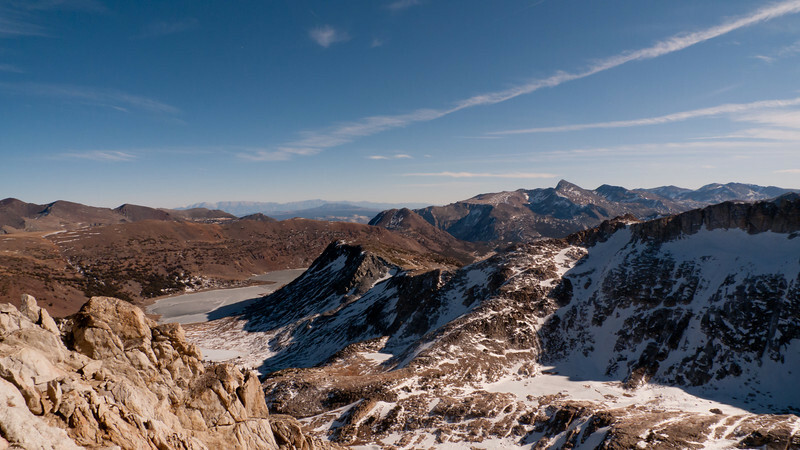 A panorama shot of the North Peak region from the Saddlebag Lake vantage. If you click the picture, it will take you to a larger size image which you can enlarge and scroll. After packing up the car and on the drive out, we caught an amazing sunset coupled with full moon rise. 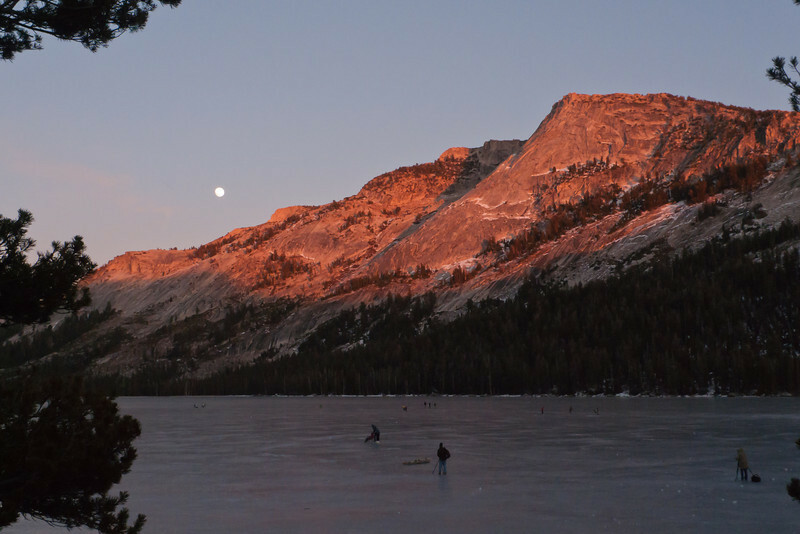 It was really cool to see all the people out on Tenaya Lake ice skating, ice fishing, playing hockey and just watching the sunset and moon rise. Alpenglow on Tenaya Peak with the full moon rising. 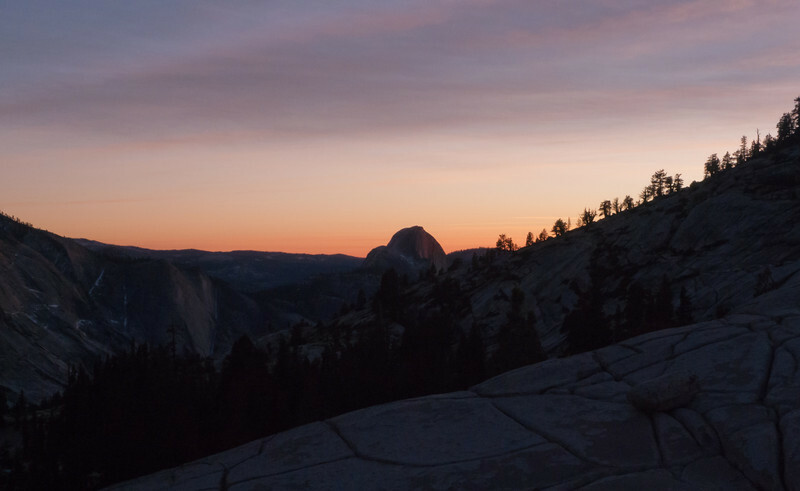 A killer sunset basks Half Dome from Olmstead Point. I really, really wish I had my big Canon 60D with 70-300m F/4.5-4.6L Cannon lens for this shot (and the moon rise), but all I had was my much smaller LX-3. it’s been on my snowboard descent list for a while – I was going to get it the last weekend in June 2010 but my lung collapsed. I was going to get it last year but the weather never cooperated. I was going to get it this year but my shoulder … well, I might still have a chance at getting it this year if we get a super fat late season pack.